Halfballs are back! Click here to find out where you can get them. Kids playing deadbox, the Philly bottlecap game. Please help us build our Philly photo database; contact us if you have a picture to share. Philadelphia, home of the Liberty Bell, Cheese Steaks and 76ers also hosts a rich tradition of street games. 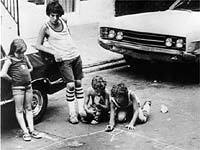 The folks here at Streetplay would like to help document the rules of Philly's street games and highlight some of the great stories and adventures these games produced. Help us create our new Philly section. Look at the following list of games. See if it perks your memory. If so, go to the Philly game discussion area and add some information. Please feel free to add any games or information that are not listed yet. Boxball - A game like stickball or baseball, but played with no bat. If self hitting, the hitter would throw the pimpleball in the air and then hit it with his fist. If pitching, the ball would be thrown on a bounce and the batter would hit by slapping or with his fist. Either way, the ball had to be hit low (waste high or down). One swing per at bat, all the other rules were like baseball. Deadbox - A squared section of the street marked off in chalk, with 6' to each side. Within the square, there were small numbered boxes in the corners and midzones and in the center of the square was a dead zone. Using caps from soda bottles or similar materials, players would shoot from one box to another, hoping to be the first to run through the course and eliminate the other contenders. Halfball - Old pimpleballs never died, they just turned into halfballs. Using half a ball, pitchers would flick spinning, diving pitches at a batter, who tried to smack it for all the distance he could. Bases were determined by the distance of the hit (no running out the bases). Click here for info on buying halfballs! Handball - Not to be confused with the more well known official one-wall or 4-wall sport. This was similar to boxball (described above), a game played with no bat, but where you'd hit the ball with your fist. In handball, you'd self hitting and as high and far as you could. What about the special rhymes, jumprope songs and clapping games unique to Philly? Please add them to the Philly game discussion area or visit our extensive girl games discussion. Hoseball - Out of pimpleballs? No problem, just find an old hose or tire, cut it into pieces 3-6 inches long and you'd have a unique Philly ball. The game was a cross between stickball and halfball. The piece of hose wouldn't go nearly as far as a regular ball, but it sure would make for some interesting games. But don't let it hit you! That would hurt! Points - Standing at the sidewalk in front of a rowhouse you'd throw the ball. If you caught it on the fly, you'd get 10 points on a bounce, 1 point. You'd decide on the winning amount needed before the game. Stepball - Similar to halfball in that it had baseball rules but no base running. But in this game, there was no bat. Standing close to the rowhouse, you'd throw the ball against the steps as hard as you could as can to get height and distance. If it landed without being caught it was a hit. Wireball - A phone company nightmare! Throw the ball up in the air and aim for the phone or electrical lines. If your opponent caught the ball it was an out. If it didn't hit the line and your opponent missed it coming down it was a single. If hit the wire on the way up and was missed, it was a home run. If you hit the wire on the way down and it was missed, you'd get a triple (Logan rules). Another version had the different wires being different bases. Now you can get halfballs courtesy of our Philly friend, Marc Polish (he's in Florida now, but you can't take the boy out of Philly). These precut halfballs use the same type of rubber as pimple balls (without stars or pimples). Though Marc isn't selling them online, you can contact him via e-mail at marcpolish@gmail.com. We know this list is far from complete. Please visit our Philly game discussion and add information about the games and stories they invoke. We also any appreciate photos of play you could send us to add to this section--please contact us if you'd like to share them with Streetplay.